Sleek and sophisticated, Worcester steel stoves make an eye-catching addition to any room. A perfect choice for making a contemporary statement, with the optional extra of a co-ordinating wood store. Expertly crafted in steel, the smooth lines and beautiful contours make the Greenstyle Bewdley a stylish addition to any room. With an uninterrupted view of the flames, the stove is cleverly designed for a stunning visual experience, offering a very authentic and natural flame picture. All Greenstyle Stoves are multi fuel with the exception of the Bewdley 8 which is wood only. The Bewdley is crafted from robust, high temperature resistant steel, providing rapid heat-up time and a very high heat transfer rate. The steel used in the Bewdley's construction also minimises the risk of hot spots which protects the body from distorting and ensures a long life span. Attractive in any interior and ideal for more contemporary homes the Bewdley is available with an integral wood store. As well as a neat and tidy optional storage solution, the wood store acts as a base, with the additional height making it the perfect freestanding stove. Finished in smart matt black, it comes in a choice of 3kW, 5kW and 8kW output models. 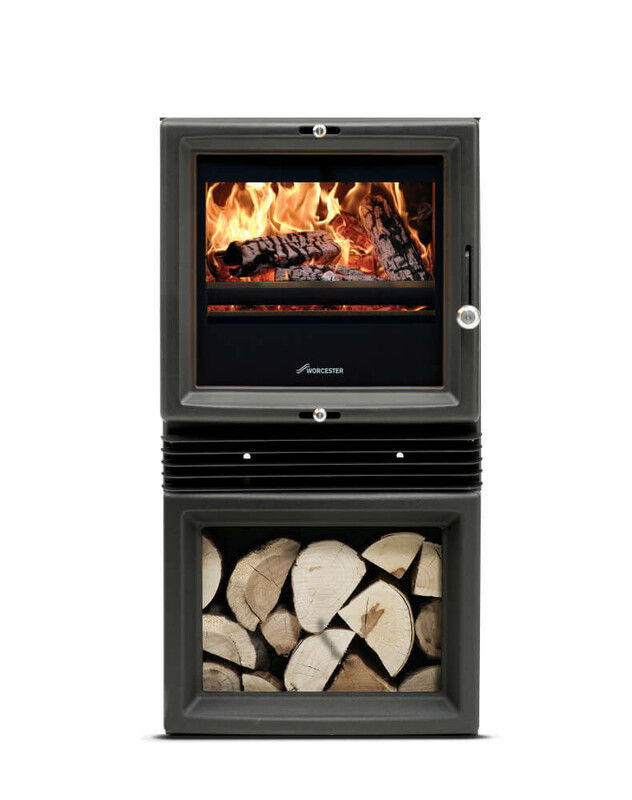 The Bewdley stove is available with an integral wood store to keep your wood neat and tidy. This optional storage solution acts a base, with the additional height making it the perfect freestanding stove. If you select the wood store then you don’t need to create a bespoke hearth if one doesn’t exist. Part of the Bosch Group - All Worcester products are manufactured with Bosch levels of quality and reliability as standard. Our reputation for innovation, world-renowned Bosch quality standards and excellent value for money sets us apart when it comes to heating. Consistently reliable heating for our customers is not just about first class manufacturing and stringent testing. We also train and accredit installers to ensure expert installation and first-rate service and support. Every Greenstyle stove is guaranteed for 5 years as standard.